New methodologies and techniques are necessary for developers of ocean wave energy converters (WEC) to overcome barriers to the development of their technology and contribute to making them competitive. One aspect of particular importance to WEC performance is associated with the water/energy conversion interface. Depending on the device the interface may be either a fluid, solid or flexible element, but will always involve a moving boundary of some type. The Australian company Bombora Wave Power (Bombora) are developing a globally unique and innovative WEC technology that uses a large flexible membrane as the conversion interface. Another feature of their patented concept is the ability to readily survive the worst possible storm conditions, potentially giving the concept huge operational and cost advantages over most existing WEC technologies. This paper presents details on the design and operation of the Bombora concept and outlines current research activities. This includes both physical scale model experiments and numerical techniques, including computational fluid dynamics (CFD) to investigate the behaviour of the device as an energy generator, provider of coastal protection and/or creator of surf breaks. 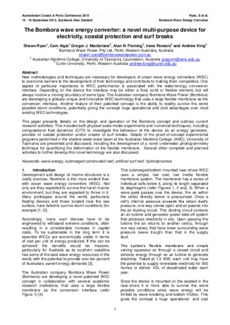 Details of the proof-of-concept experimental programs performed in the shallow water wave basin at the Australian Maritime College (AMC), University of Tasmania are presented and discussed, including the development of a novel underwater photogrammetry technique for quantifying the deformation of the flexible membrane. Several other complete and planned activities to further develop this novel technology are also discussed.